For many people, post-workout recovery includes a dose of fast-acting carbohydrates. But do you really need carbs as part of your post-workout meal for optimal gains? I have a confession to make: I like to eat candy after I work out! If you've followed any of my diets, you already know I'm a big proponent of eating high-glycemic, fast-digesting carbs immediately after my workouts. Aside from specific low-carb phases, most of the nutrition programs I write include post-workout carbs alongside supplements like protein, creatine, beta-alanine, carnitine, and betaine. I prefer dextrose as my post-workout carb source, which can be found in supplements like Post JYM, or in tasty sweets like Pixy Stix and gummy bears. I've received a lot of questions lately about the importance of post-workout carbs. Some people are confused about how carbs factor into recovery and growth, while others worry that carbs will spur fat gain. If you're curious about the power of post-workout carbs, this article will help you understand their place in your recovery regimen. The main reason to consume carbs post-workout is to replenish the muscle glycogen that you burned during your workout. As you train, your main fuel source is muscle glycogen. Glycogen is the storage form of glucose. It is composed of long strings of glucose molecules with numerous branches. The glucose break from the glycogen chain as needed in order to generate ATP, which transports chemical energy and is crucial for muscle contractions. Research confirms that the best way to replenish muscle glycogen stores after workouts is to consume high-glycemic (fast-digesting) carbs as soon as possible. Research confirms that the best way to replenish muscle glycogen stores after workouts is to consume high-glycemic (fast-digesting) carbs as soon as possible. Some "experts" argue that during a typical weight-lifting workout, you don't burn up enough glycogen to be concerned about replenishing it. To that I say, "What?!" When you deplete any amount of muscle glycogen, you should be concerned with replacing it—especially if muscle growth is your main goal. If a trainer claims people don't need to worry about replenishing glycogen, then that trainer's workouts are very low-volume and very low-intensity, or they haven't done any research. The research on glycogen usage during resistance training shows that workouts consisting of anywhere from 6-20 sets and lasting roughly 15-30 minutes in length deplete muscle glycogen levels by about 30-40 percent. Since my workouts last 60-90 minutes, force you to move rapidly between exercises, and use high-intensity training techniques like cardio acceleration and Tabata, they'll deplete your muscle glycogen levels by a good 60-75 percent. Take your carb intake seriously and replenish your muscle glycogen stores. Not doing so is cheating your muscles and limiting recovery. In fact, delaying carb consumption by just 2 hours has been shown to reduce the rate of glycogen replenishment by 50 percent! Even so, some experts argue that none of this matters for most people in the gym because some minimal evidence suggests that, whether you consume carbs immediately after training or two hours later, glycogen levels replenish themselves within 24 hours. Again, the evidence for this is weak. What we are sure of is that the quickest way to replenish muscle glycogen is to consume high-glycemic carbs immediately after a workout. Fully replenishing your muscle glycogen levels as quickly as possible after workouts is important for growth. Stored glycogen in muscle cells pulls water into those cells. This increases the muscle cell volume and therefore muscle fiber fullness. Given that you gain a muscle pump during the workout, which also increases the amount of water in the muscle cells and therefore the volume of those cells, quickly replenishing muscle glycogen levels can help you maintain a higher muscle cell volume for a longer period. This can be important because evidence suggests that a greater muscle cell volume instigates changes in the muscle that lead to long-term muscle growth. Another benefit of consuming carbs—especially high-glycemic carbs like dextrose—immediately after an intense workout is that you'll feel rejuvenated. Carbs can take you from feeling wiped out and lethargic after a brutal workout to energetic and well-fueled. Plus, eating high-glycemic carbs after a workout typically satisfies a massive craving for sugary or starchy carbs without a negative impact on your diet progress. I often recommend gummy bears for post-workout carbs, which most people find very satisfying. As an added bonus, a post-gym gummy often helps people "bear" through strict dieting the rest of the day. Another benefit of high-glycemic carbs is the insulin spike that they deliver. While insulin is considered an anabolic hormone, its role in muscle growth is now often debated. While it was once believed to be a critical factor in initiating muscle protein synthesis and decreasing muscle breakdown, some evidence now suggests that insulin is not that critical for muscle growth. The delivery of adequate amino acids to muscle cells from substantial amounts of protein appears to be more critical. Only recently has research compared the consumption of post-workout protein alone to the consumption of post-workout protein plus carbs. 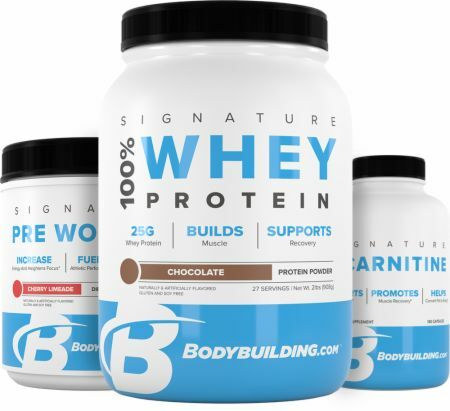 This research shows that, as far as protein synthesis is concerned, the addition of carbs to a protein shake does not boost muscle protein synthesis or decrease muscle protein breakdown to any greater extent than a protein-only shake. But insulin is still important immediately after workouts. Insulin attaches to specific receptors on muscle cells. When this happens, it allows for glucose and amino acids, as well as creatine and carnitine, to be taken up by muscle cells. In fact, research shows that both creatine and carnitine are highly dependent on insulin to gain entry into muscle cells and provide benefits. Since you should be taking these two supplements post workout, you will want to maximally spike insulin levels if muscle mass is your main goal. That being said, during periods of dieting when you have to slash all carbs—including post-workout carbs—a post-workout protein shake and BCAAs will adequately spike insulin to drive these supplements into your muscles. Consuming pure glucose—also called dextrose—after a workout means the body doesn't need to digest it. Because post-workout glucose can be absorbed into the bloodstream almost as quickly as it's ingested, it gets to your spent muscles as rapidly as possible, resulting in the quickest and most complete replenishment of muscle glycogen. This will keep muscles stocked with ample glycogen for your next workout and pull water into your muscle cells, maximizing your muscle size. The sugar fructose—which makes up 50 percent of the sugar in most fruits, honey, and sucrose —is actually a low-glycemic carbohydrate. Fructose is a form of sugar that the body doesn't really use well. Because of its structure, it can't be directly turned into muscle glycogen like glucose can. When you consume fructose—fruit or high-fructose corn syrup—it's not absorbed immediately into the bloodstream like glucose/dextrose. Instead, the majority of it must travel to the liver, where it can be converted into glucose and stored as glycogen to be released as glucose when the liver deems it necessary to maintain blood glucose levels. Since it won't optimize muscle glycogen replenishment, fructose is not a great post-workout choice. That's one of the main reasons I recommend opting for gummy bears and Pixy Stix over fruit or other candies. Most candy uses high-fructose corn syrup or sugar as the main sweetener. Table sugar (sucrose) is about 50 percent fructose and 50 percent glucose, while high-fructose corn syrup is about 55 percent fructose or more. Wonka Pixy Stix are sweetened with 100 percent dextrose. Most gummy bears, such as Haribo brand, use dextrose and corn syrup. Corn syrup is primarily glucose and is considerably different from adulterated high-fructose corn syrup. Many people worry that fast carbs after workouts will make them fat. However, the post-workout period is the one time of day when you're almost guaranteed that those carbs will not be converted into body fat. Unless you've cut carbs from your diet entirely, don't risk suboptimal gains by skipping post-workout carb consumption. If you're dieting to lose body fat and you're consuming carbs at any other meals of the day, the last thing that you want to do is nix the post-workout carbs. If anything, cut carbs from other meals and save them for right after your gym session. Unless you've cut carbs from your diet entirely, don't risk suboptimal gains by skipping post-workout carb consumption. Maybe you're worried about post-workout carbs because some expert claimed eating carbs right after a workout can lower growth hormone (GH) and testosterone levels, but the recommendation to forgo carbs immediately after workouts to prevent a drop in growth hormone and testosterone levels is severely flawed. Why? Because growth hormone and testosterone levels peak during a workout; when the workout is over they plummet rapidly. Growth hormone and testosterone levels are going to fall after a workout regardless of whether or not you eat anything. So eat up after workouts and stop worrying about your already plummeting hormone levels. To truly maximize muscle recovery and growth, your best bet is to consume fast carbs along with protein immediately after workouts. There's really no debating how well this strategy works in the real world. Skipping carbs after a workout to prevent a drop in hormone levels or because they don't increase muscle protein synthesis is silly if you're eating carbs at other meals. The post-workout window is the best time to maximize the utilization of those carbs, and it helps with the utilization of other supplements—like creatine and carnitine—that you should be taking post-workout. The only time you should cut carbs from your post-workout meal is when you have slashed all carbs from your diet, except for the small amount in vegetables and protein powders. This should only be done when fat loss is your primary focus. The good news is that, even without carbs, muscle protein synthesis will not be compromised. Even insulin will spike as long as you consume a protein powder, and the addition of BCAAs will enhance the effect. Immediately after workouts, shoot for about 40 grams of protein from a mix of whey and casein, to maximize muscle protein synthesis. Consider adding 5-10 grams of BCAAs post-workout to ensure maximal protein synthesis and further boost the insulin spike. This is especially important if you are in a carb-free post-workout phase of your diet. When consuming carbs, go with 20-60 grams of high-glycemic carbs after your workouts depending on your weight, goals, and the intensity and duration of the workout. If you find that a big dose of high-glycemic carbs leaves you feeling lethargic, then have a smaller dose of high-glycemic carbs (15-30 grams) and follow it with a small dose of low-glycemic carbs (15-30 grams) such as fruit, oatmeal, or a sweet potato. During phases of your diet where you are slashing all carbs and need to skip post-workout carbs, have 40 grams of a protein shake and 5-10 grams of BCAAs. This will keep you anabolic, despite being low carb. Maximize your workouts with this energy and recovery stack! Robergs, R., Pearson, D., Costill, D., & Fink, W. (1991). Muscle glycogenolysis during differing intensities of weight-resistance exercise. Journal of Applied Physiology, 1700-1706. Essen-Gustavsson, B. and Tesch, P. (1990). Glycogen and triglyceride utilization in relation to muscle metabolic characteristics in men performing heavy-resistance exercise. European Journal of Applied Physiology, 5-10. Tesch, P., et al. (1986). Muscle metabolism during intense, heavy- resistance exercise. European Journal of Applied Physiology, 362-6. Ivy, J. (1998). Glycogen resynthesis after exercise: effect of carbohydrate intake. International Journal of Sports Medicine, 142-5. Staples, A. W., et al. Carbohydrate does not augment exercise-induced protein accretion versus protein alone. Med Sci Sports Exerc. 2011 Jul;43(7):1154-61. Koopman, R., et al. (2007). Coingestion of carbohydrate with protein does not further augment postexercise muscle protein synthesis. American Journal of Physiology Endocrinology and Metabolism, 833–42. Casagrande Figueiredo, V. and Cameron-Smith, D. (2013). Is carbohydrate needed to further stimulate muscle protein synthesis/hypertrophy following resistance exercise? Journal of the International Society of Sports Nutrition, 42. Caronia, L. M., et al. (2014). Abrupt decrease in serum testosterone levels after an oral glucose load in men: Implications for screening for hypogonadism. Clinical Endocrinology, 291-296.